If we know the width and height then, we can calculate the area of a right angled triangle using below formula. Using Pythagoras formula we can easily find the unknown sides in the right angled triangle. 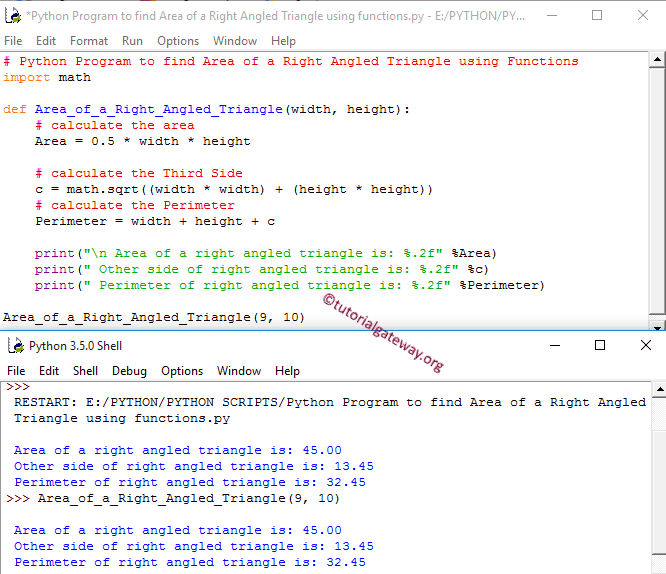 This python program allows the user to enter width and height of the right angled triangle. Using those values we will calculate the Area and perimeter of the right angled triangle. Following statements will allow the User to enter the Width and Height of a right angled triangle. Here we used sqrt() function to calculate the square root of the a²+b². sqrt() is the math function, which is used to calculate the square root. This program allows the user to enter the width and height of a right angled triangle. We will pass those values to the function arguments to calculate the area of a right angled triangle. First, We defined the function with two arguments using def keyword. It means, User will enter the width and height of a right angled triangle. Next, We are Calculating the Area of a right angled triangle as we described in our first example.